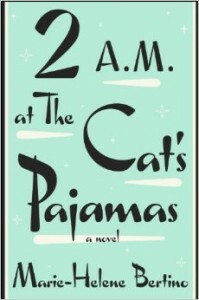 2 A.M. AT THE CAT’S PAJAMAS begins on a quiet morning in a Philadelphia apartment the day before Christmas Eve, where we meet the precocious and smart-mouthed nine-year-old Madeleine Altimari. Madeleine’s mother has recently died, and her father is still lost in his grief. Meanwhile, Madeleine finds solace in music and aspires to become a jazz singer. Just two days shy of her tenth birthday, she is about to have the most remarkable day of her life. After facing down mean-spirited classmates and rejection at school, Madeleine decides today is the day to find Philadelphia’s legendary jazz club, The Cat’s Pajamas, and make her debut. On the same day, Madeleine’s fifth grade teacher Sarina Greene, who has moved back to Philly after a divorce, is nervously looking forward to a dinner party that will reunite her with her high school love. And across town at The Cat’s Pajamas, club owner Jack Lorca discovers that his beloved venue may close be closed due to financial woes by the end of the night. As we follow these three lost souls over the course of twenty-four hours, we also meet a cast of unique and brilliant characters who surround them – from the warm-hearted cafe owner Mrs. Santiago to Melissa, the former “snake lady” exotic dancer who might be Lorca’s last hope for love. With sharp wit and irrepressible spirit, Marie-Helene Bertino turns Philadelphia into a magical place where anything can happen. Marie-Helene Bertino is the author of the story collection Safe as Houses, which won the 2012 Iowa Short Fiction Prize and The Pushcart Prize, and was long-listed for The Story Prize and The Frank O’Connor International Short Story Prize. An Emerging Writer Fellow at New York’s Center for Fiction, she has spent six years as an editor and writing instructor at One Story. There’s an entire episode of the TV series How I Met Your Mother devoted to the concept that “nothing good happens after two am.” This novel, however, turns that concept on its ear. Marie-Helene Bertino has created a collection of characters who could populate almost any large city. All of them are a little bit eccentric, incredibly interesting, and compelling to read about. Any one of them could have been the central character in this novel, but the author chose to make nine-year-old Madeleine the focal point, and in doing so, she’s given us the best child character ever. She’s also proven that you can write a book about a child without it being children’s literature (not that there’s anything wrong with that), which is something a lot of contemporary authors seem to have forgotten. In any case, nine-year-old Madeleine reminded me of, well, me at that age. Okay, I wasn’t into smoking, and I didn’t curse (much) but the very structured singing practices in my room? Check. The not having a ton of friends? Check. (I have a few very close friends, but I was never one for big crowds.) The never quite fitting in, and mostly not really caring, except maybe a little? Check and check again. It is these very real factors that made Madeleine sing on the page even when she wasn’t actually, you know, singing. I also liked the way the novel is set in today’s world, but had a very noir feel to it. No, it’s not a hardboiled detective novel, but it feels like it could slide into such a story for color, and be right at home. The adult characters are just as well-defined, and well-realized. I was often annoyed with Sarina (Madeleine’s teacher) for not standing up to the principal and being more of an advocate for Madeleine, just as I wanted to slug Madeleine’s father, a lot, and then hug him after. Even the glimpses into the mind of Pedro the dog (no, really) were fascinating to me, because everything just…worked. At times poignant and sweet, at times pathetic and sad, and at times raucously comic, this novel defies categorization, but should not be overlooked. It’s fantastic, and fresh, and if you don’t read it, you’ll be missing a treat. Goes well with espresso and a plate of cannoli…or a caramel apple.